CMS missionary Mandy Jones (with Wayne) reflects on how Nungalinya College is helping support the Aboriginal church in reaching out to youth in remote communities in North Australia with the gospel. I’ve been teaching basic numeracy skills to Aboriginal people as part of the ‘Foundations’ course at Nungalinya College, as well as a course targeted at supporting youth. So I have tried to explain the complex challenges facing youth in remote Aboriginal communities using a mathematical ‘Venn’ diagram (below). The large outer circle represents the problems common to all young people, and the three smaller circles represent other overlapping issues. Firstly, very limited education options and employment opportunities for young people in remote areas. Secondly, kids from low socio-economic backgrounds face various problems including higher levels of family dysfunction. Thirdly, they must grapple with the cultural issues of minority groups including English as a second (or third or fourth) language, family value clashes with mainstream Australia, and remnant racism. 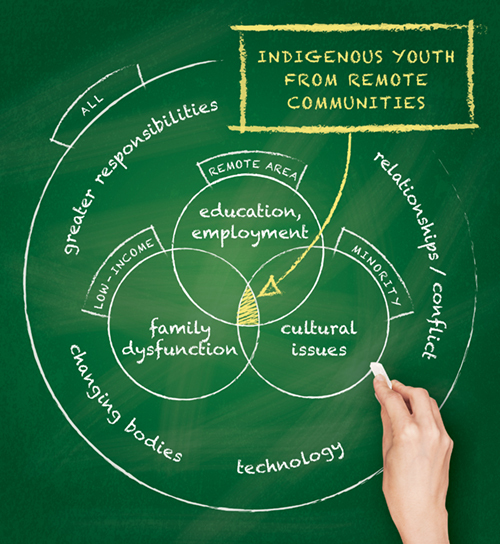 The shaded section in the middle where all four circles overlap represents the problems faced by Aboriginal youth from remote communities. Most adults in Aboriginal communities feel overwhelmed by all of these issues. But Aboriginal Christians really want to do something to help their young people. In light of the needs and the desire of Aboriginal church leaders to support youth in their communities, Nungalinya College recently introduced a Unit called ‘Working with Youth,’ into the Certificate III in Theology and Ministry. The Unit aims to develop skills in listening and communication, supporting young people and understanding youth culture. Students also consider what the Bible says about young people and the role of older people in teaching them about Jesus. For the Nungalinya students the highlight of the ‘Working with Youth’ course is organising a chapel service for boarders from remote communities at Kormilda College in Darwin. In planning the service the students try to put into practice what they have learned about youth by considering what the boarders will enjoy and find relevant. The students from Nungalinya love having the opportunity to share their faith in a real and practical way, and the school students love seeing and hearing expressions of indigenous Christianity, from ordinary Aboriginal people like themselves. The service is unique – teenage boys participate in action dances and singing, and volunteer to help with learning the memory verse written on sheets of paper. The chapel service at Kormilda College is not the best way to share the gospel with young people, nor is it likely to change lives. But this one-off event each year is really a means to an end. The end, under God, is that Nungalinya students are empowered to minister to the young people in their communities in relevant, helpful ways. If our students can do that, then lives will change. To help strengthen the Aboriginal church for future generations, in addition to the work that Nungalinya is doing, CMS would love to place qualified youth and children’s workers in various locations in North Australia in the coming years. Please pray that God would use the ‘Working with Youth’ course to strengthen the ministry of the church to young people in North Australia, and ask that he would work in mighty ways to bring Aboriginal youth from remote communities to know Jesus.